Social media (SoMe) comprises a number of internet-based applications that have the capability to disseminate multimodal media and allow for unprecedented inter-user connectivity. The role of Twitter has been studied in conferences and education; moreover, there is increasing evidence that patients are more likely to use social media for their own health education. The aim of this study was to assess the impact of social media platforms on the impact factor of both urological and paediatric journals that publish on paediatric urology, and to assess parental awareness of social media in paediatric urology. A filtered Journal of Citation Reports (JCR) search was performed for the period 2012-16 for journals that published articles on paediatric urology. Journals were ranked according to impact factor, and each individual journal website was accessed to assess for the presence of social media. Parents in paediatric urology clinics and non-paediatric urology patients also filled out a questionnaire to assess for awareness and attitudes to social media. All statistical analysis was performed using Prism 6 software (Prism 6, GraphPad Software, California, USA). Overall, there were 50 urological journals and 39 paediatric journals with a mean impact factor of 2.303 and 1.766, respectively. There was an overall average increase in impact factor across all urological journals between 2012 and 16. The presence of a Twitter feed was statistically significant for a rise in impact factor over the 4 years (P = 0.017). The cohort of parents was statistically more likely to have completed post-secondary education, to have and access to a social media profile, use it for health education, and use it to access journal/physician/hospital social media accounts. 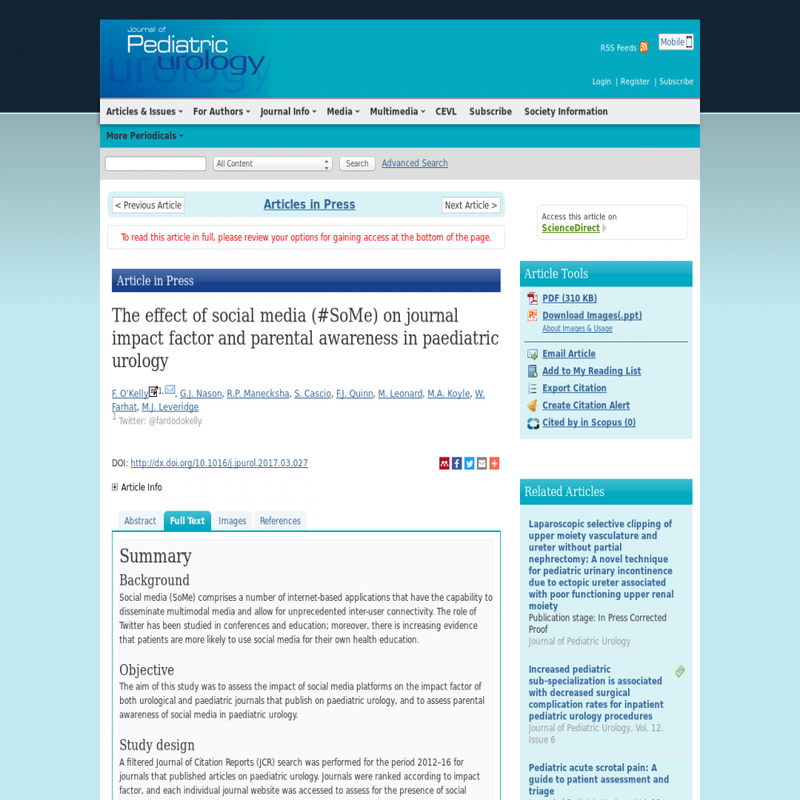 This study examined, for the first time, the role of social media in paediatric urology, and demonstrated that SoMe use is associated with a positive influence in impact factor, but also a parental appetite for it. Limitations included a non-externally validated questionnaire. There may also have been bias in larger journals that generate and maintain social media platforms such as Twitter, which may then in turn have an influence on impact factor. Social media use within paediatric urology was associated with a higher impact factor, which remained significant after 4 years of analysis. Parents were more likely to use a wide variety of social media to search for conditions and physicians/healthcare providers; therefore, journals and institutions need to embrace and endorse SoMe as a potential source of important clinical information.